Elements of the 10th Panzer Division, Army Group 'Afrika' counter-attack Allied Forces around Tebourba in northern Tunisia, early Spring 1943. Overhead, air support is provided by the Junkers Ju 87D's of St.G3 and the formidable Focke Wulf Fw190A fighters of II/JG2. Matching numbered certificate of authenticity included. Overall print size 35" x 23 1/2" Printed in lightfast inks on acid free archival paper. 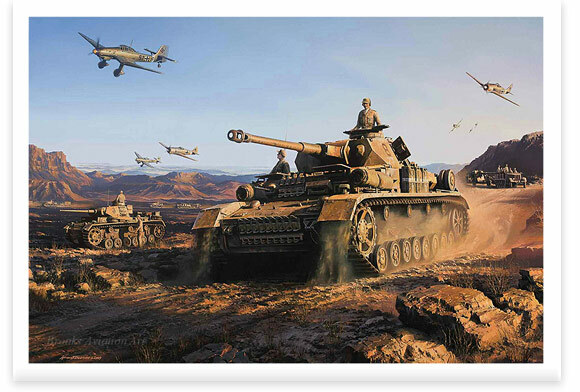 Every print in this stunning new edition is signed and numbered in pencil by the artist Nicolas Trudgian and the following veterans. The Artist Special Reserve edition is signed by the artist only and is limited to just 50 prints worldwide. The Eagle edition is signed by five pilots and two Wehrmacht Knights Cross recipients. The Panzer Edition is signed by fourteen Fourteen Knights Cross recipients. Hans Krohn - stuka - K.C.winner, Norbert Kujacinski - tank - K.C.winner, Wilhelm Noller - stuka - K.C.winner, Erich Rudorffer - fighter pilot - Swords winner,Günter Seeger - fighter pilot - K.C.winner, Otto Schultz - fighter pilot - K.C.winner.